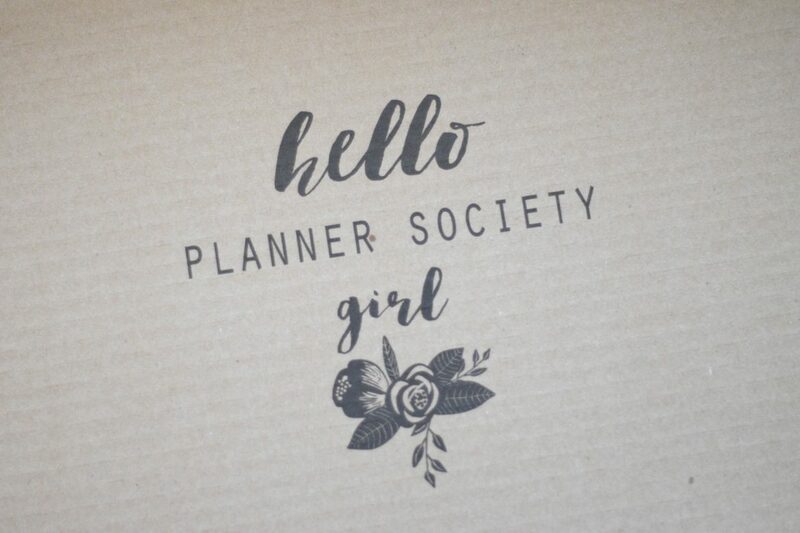 I finally signed up to the Planner Society! After missing out on the lovely fox themed October box, I knew I had to sign up for November! After signing up at the start of the month I had a painful wait for it. Thankfully Christy posts lots of sneaks on her Instagram to keep me excited. Normally, I wouldn’t be too bothered about sneak peeks – I like the surprise. But with this box it’s different as throughout the month I love seeing what I’m about to get as I can start planning what I’m going to use everything for. So after signing up on the first of the month there is quite a wait. I got my box on the 25th of the month. It was perfectly timed though, as it arrived a day I was home ill from work. It’s arrival definitely perked me up! It really was like Christmas opening the box! Everything was packaged up beautifully in gorgeous paper bags that matched the theme. I’m a sucker for packaging but I love such attention to detail – even the stickers that seal the bags are perfect! Obviously as I was opening the box all I could think was ‘hmm I could use these bags for making things with too!’ Literally every bit of this is usable! In my head this kit kind of comes in three different parts, but everything is so versatile you can pretty much use it for any kind of crafty pursuit you do. You don’t even need to be a planner girl to be honest. Scrapbookers would love this too and I’m even thinking of cards I can make with these goodies. The papers are beautiful. They’re super thick and have a lovely texture to them. The designs themselves are fabulous and work well with Winter but are so versatile you can use them whatever time of the year you want. The die cuts are a little thinner than you’d expect but sometimes that’s no bad thing. There’s nothing worse than a thick die cut bulking up your planner or scrapbook. The designs are super pretty and while I don’t really use die cuts in my planning these will be ending up either in my scrapbook or on a birthday card soon! These cork shapes are interesting and almost go against having thin die cuts. These will bulk up anything! These will probably get used less than any of the other bits but I’ve used a couple on a dashboard and am hoping to work some of the flowery ones onto a card at some point. They’re a little bit fragile so I can’t be too heavy handed with them. The next load of goodies are the stationery. From looking at the sneaks each month you’re pretty much guaranteed a pen every month which is awesome as I am a complete pen addict! I was so excited for the pencil case! It’s such a pretty design and I’m definitely overdue a nice new case. My only disappointment with this is the zip isn’t all that smooth. It’s not a huge deal but it’s not 100% perfect. I’m not a big paperclip person but this little deer paperclips are ridiculously cute. They definitely got moved straight into the planner. The pen is very funky but is sadly a ballpoint. I’m not a ball point kinda girl so I’ll be gifting this to my mum, as she’ll love it. This washi tape is a really nice design and a lovely quality tape. Knowing how nice the tape is I’m very tempted to sign up to the washi kit add on to the box! Finally there was a cute little travelers notebook charm with real paper inside! It’s such a nice little touch but I don’t use charms like this anywhere sadly. I’ll try and find another use for it at some point. This box wouldn’t be complete without some proper planning goodies. So the post it notes could definitely be filed under ‘stationery’ but they so looked so much better photographed with these! They are a super cute design but a little bit big for use in my personal planner. They’re also not that sticky. I was so disappointed! It’s not the end of the world though as I mainly just use my post its as notelets rather than to stick anywhere. The two sheets of planner stickers are such fabulous designs I couldn’t wait to use them! They obviously match everything perfect and they’re a nice high quality sticker and also cut perfectly. The tabs and stickers to use with them are a fantastic touch. Tabs are always the hardest part of making dividers so to have it all made for you is ideal. Four sheets of labels is also really generous and I had no issue finding applicable ones for a planner set up. So I haven’t tried these stamps yet but they definitely make me want to bring my bullet journal back for 2017 so I can use them! They seem like a really nice quality and so I’m looking forward to having a play with them. The gift tags are really nice and thick, and feel really well made. They felt a little random compared to everything else but I guess that’s because I’m not big on filling my planner with lots of little bits and pieces. I see lots of pictures on Instagram of pockets stuffed with lots of pretties but I’m just not good at pulling things like that together. I may actually use most of these at Christmas instead! Rather than just take you through all the goodies in this month’s box (of which there are many) I wanted to show how I’ve been using the kit so far. First and foremost, for planning! This was the week I planned using the kit, straight after receiving it. I didn’t go too mad with the stickers but I really liked how this turned out, particularly the to do list in the bottom right. Next I set up my 2017 planner using the kit. As you can see, I managed to use a gift tag and some of the cork stickers. You’ll also see some patterned cards in the pockets. As I don’t use the pockets too much other than for sticky notes I popped these in there for a little decoration. They’re actually part of the box packaging. I think these came as backing cards to some of the bits like the stamps or die cuts. You literally can use every part of this box! I’m going to do a full set up post at some point as there’s more I need to add to this planner but I’m loving what I’ve done so far. The papers are ideal for dividers and are double sided so both sides look cute. I’ve chosen not to laminate these as they’re thick but this is only going to be a secondary planner. If it’s your day to day planner, you probably need to laminate the dividers. I haven’t been able to sit down and make some cards yet with this kit but I will. I need to replenish my birthday card stash and when I do, I’ll be sure to share it either here or Instagram. Wow. This is the longest post I’ve written in quite some time! If you can’t tell by now I seriously love this kit. It’s just over £30 including delivery and for the amount of high quality items you get, it’s so worth it. The fact that it’s also one of a kind products and designs you won’t get anywhere else just makes it even better. It’s also not season specific product which as someone who doesn’t re-set up their planner every season is perfect. I will be more than happy using most of what I received above throughout the year and the planner I’ve set up with the papers will last me all year (unless I completely change up my set ups). If you want to go check the Planner Society out, click here. You have to sign up for at least three months which is part of the reason why it took me so long but I’m so sad it did take me months. £30 can be quite a lot to spend on paper goods each month but between using them in my planner, scrapbooking and making cards I will need to spend less on other supplies each month. I hope.